Deck the halls with this striking Daisy glass ornament. Two sided with colorful daisy petal design one side and "Girl Scout Daisy 30th Anniversary" in silver glitter on the other side. 3 1/2" round flat disc-shaped ornament. Imported. Red and green jingle bell bracelet. 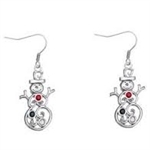 These Melting Snowmen are perfect stocking stuffers! Small plush holiday toy measuring about 4". Available in either black or red hats; we'll select.